I love catching up with these two honest hardworking couple and their efforts to simplify their lives without leaving an imprint on this world of ours. I love the fact that they are not scared to be themselves or that they conform to what other people think they should be doing. They are delightfully "alternative" and passionate about everything they are involved with. They have home educated their children as well as running their own business and have been good role models in daring to be different and meeting their own ethical requirements rather than follow like sheep along a well trodden path. There are always other choices and I like their honesty, sincerity and most definitely their love for each other and their humour. Liebster is a German word meaning dear & the award is a way to show support to bloggers who currently have less than 200 followers. Elizabeth lives in a beautiful part of Southern California & shares wonderful photos & thoughts about her life. 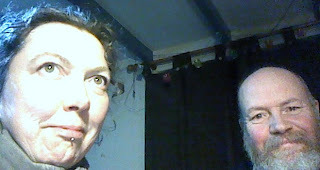 Karin writes about her steps towards sustainable living, current affairs, spirituality & peace. She lives in South East England. Gai doesn't post very often, but when she does - she writes about life in Bristol, family, religion & sustainable living. Pattypan is always on the go - busying about, making, cooking, baking, preserving & ironing! An inspiration with her frugal living, lovely recipes & helpful advice. Nic thinks her life's not very interesting, but she's getting married next year & is watching what she eats. She shares lovely foodie photos & hopefully she'll post more in the future! Sooz is a vegan, knitting gardener. She is very keen to live as ethically & sustainably as possible & has a very happy & colourful blog! Thank you all for keeping us entertained, enthralled & educated. We do have lots of blogs on our roll, but we probably haven't looked at most of them since first following them, we're hopeless. I would be severely worried if you were not "Rebels"
To my favorite rebels - thank you for mentioning my blog. Some sort of sport - good thing I like you so much otherwise I would be upset. Thank you Kath & Pattypan - you both make us feel very special! It's very hard keeping up on all the fun blogs out there. Thanks for the recommendation. You're right. I haven't been posting very often. Not from lack of having anything to say, but from not being sufficiently organised to get it online. Will try to do better in the New Year. Now where have I heard that before?